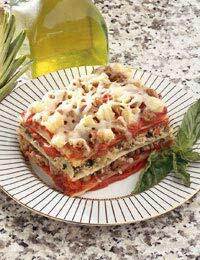 Lasagne is a great recipe to cook if you're entertaining. Most people love this meaty Italian dish and it's not even a problem if you're catering to veggies - you can simply swap the lamb mince for soya or make two smaller lasagnes (one meat and one veggie) if you're feeling particularly adventurous and have enough pans to spare. If you've never attempted to make a lasagne before, it's probably best not to save this honour for guests - it's one of those dishes that's really easy to make when you know how, but there's nothing worse than getting flustered and stressed when your mates are coming round. Try a smaller version for yourself first so that you get the hang of the timings and then you'll be ready to wow everyone on the big night. Lasagne is homely, hearty and ideal for sharing. Once you've done all the prep, it's a one-dish dinner, so there's no need to worry about different elements of the meal being ready at the same time, or plating up everything before it gets cold. You just bring the lasagne straight to the table and dish it up there. You should make a big bowl of salad to accompany it and maybe serve some warm crusty bread, as well. A couple of bottles of nice Italian red wine will round off the meal and you should have a table full of replete and contented guests by the end of the meal. Butter a large ovenproof dish. Heat the oil in a large pan, add the onion and garlic and stir until softened. Add the lamb mince and cook, stirring, for about 5 minutes, until it is beginning to brown. Add the mushrooms, tomatoes and Worcestershire sauce to the pan and season well with salt and pepper. Stir well and simmer for about 20-30 minutes, until the sauce has reduced down to a thick consistency. Preheat the oven to 180C/350F/Gas Mark 4. Spoon one-quarter of the meat sauce into the bottom of the dish and spread evenly around. Place 3 lasagne sheets on top and break off pieces of the extra sheet to fill any gaps at the edges. Spoon one-third of the white sauce over this. Add the next quarter of meat sauce, followed by 3 lasagne sheets and another one-third of the white sauce. Repeat once more, adding the last of the meat sauce before the final layer of white sauce. Mix the cheeses together and sprinkle over the top. Cook in the oven for about 1 hour. This dish will impress your guests but won't leave you stressed. If you like, you can do all the preparation earlier in the day then keep the lasagne in the fridge until you're ready to cook. Then all you need to do is cook it and serve. For authenticity add a good pinch or two of oregano and use bay leaves whilst cooking the ragu (meat sauce) remembering to remove them before assembling the lasagne.